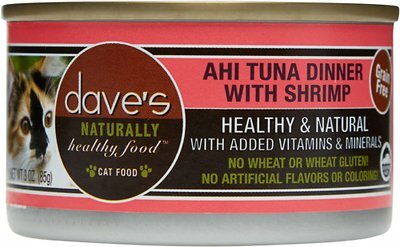 Give your kitty the high-protein nutrition he needs to thrive with Dave's Pet Food Naturally Healthy Grain-Free Ahi Tuna Dinner with Shrimp Canned Cat Food. Purr-fect for tuna lovers, it provides plenty of protein to fuel all those adventures, with ahi tuna as the first ingredient plus whisker-licking shrimp. Every juicy bite is loaded with wholesome omegas for a lustrous coat, plus vitamins, minerals and essential taurine to help your pal look and feel his best. With no grains, wheat, gluten or anything artificial, even kitties with sensitivities can dive into their bowl. Grain-free wet food is made with ahi tuna and shrimp as the top ingredients for animal sourced protein to support healthy muscles. 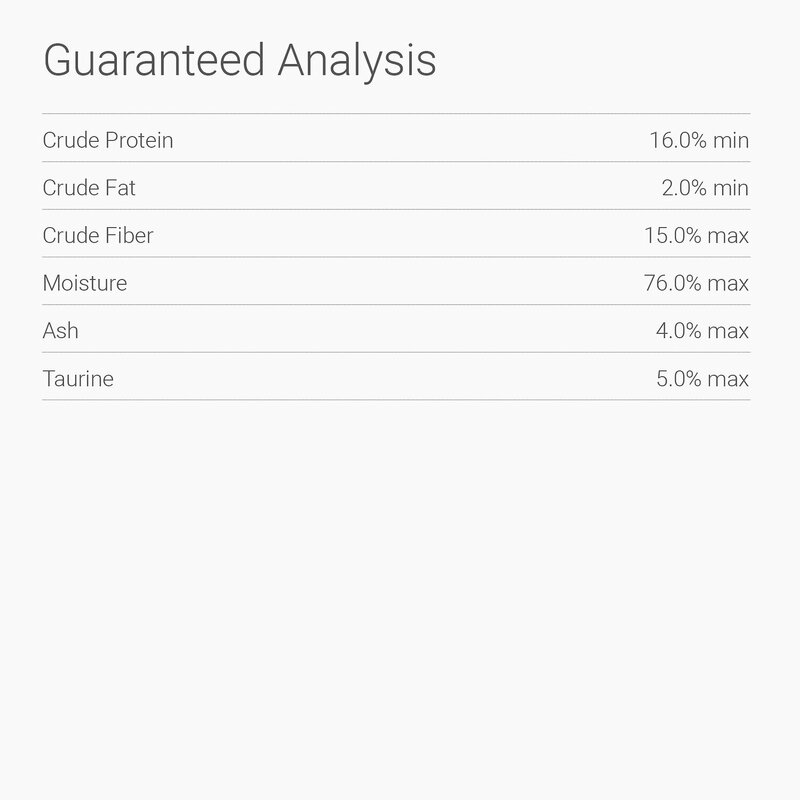 Contains omega-3 and 6 fatty acids to nourish skin and fur, with zero grains, wheat, gluten or GMOs so it’s great for kitties with sensitivities or food allergies. Supports digestive and urinary health by providing adequate hydration from tasty gravy. Provides a complete and balanced diet for all cat breeds, on its own or as a tasty kibble topper. 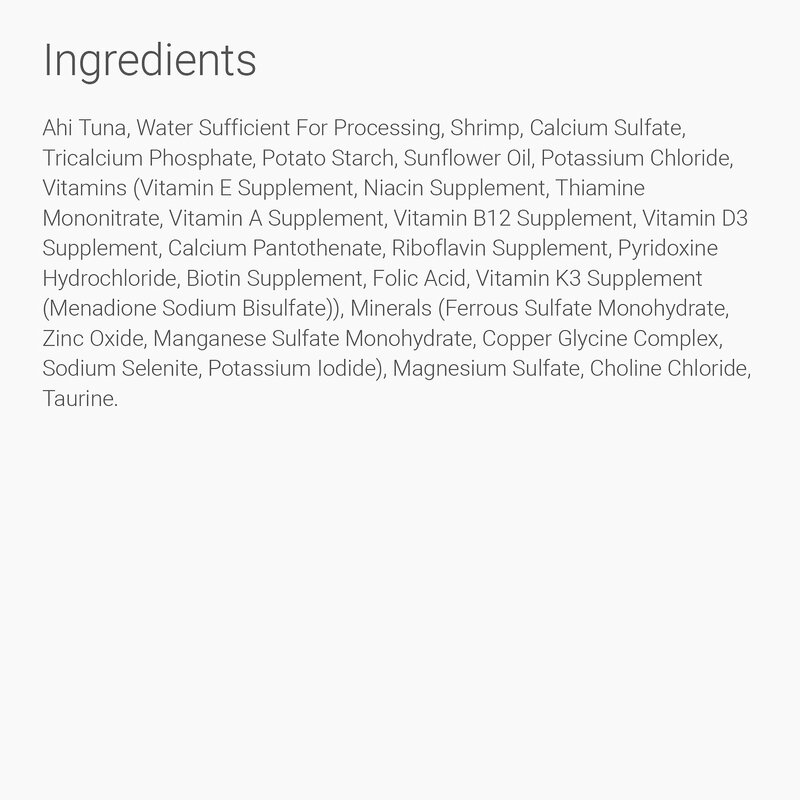 Ahi Tuna, Water Sufficient for Processing, Shrimp, Calcium Sulfate, Tricalcium Phosphate, Potato Starch, Sunflower Oil, Potassium Chloride, Vitamins (Vitamin E Supplement, Niacin Supplement, Thiamine Mononitrate, Vitamin A Supplement, Vitamin B12 Supplement, Vitamin D3 Supplement, Calcium Pantothenate, Riboflavin Supplement, Pyridoxine Hydrochloride, Biotin Supplement, Folic Acid, Vitamin K3 Supplement (Menadione Sodium Bisulfate)), Minerals (Ferrous Sulfate Monohydrate, Zinc Oxide, Manganese Sulfate Monohydrate, Copper Glycine Complex, Sodium Selenite, Potassium Iodide), Magnesium Sulfate, Choline Chloride, Taurine. Ugh. 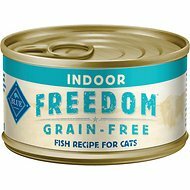 I'm sorry, but my cats HATE this food. Even the dog won't eat it and she eats pretty much everything. I tried twice and both times the food sits overnight and then it gets thrown in the trash. Sorry Dave. But for me it stinks so bad I probably won't buy it again LOL. I have a sensitive nose if you don't, give it a try. All three 3 my cats liked the food. One of my cats love this.She is always begging for my seafood ; now she has her own. Convenient shipped to my door; saves me 1 1/2 of my time driving to a store. This food was a big NO..from me and my 5 cats..not one of them would touch it and I don't blame them it looked awful and smelled even worse. Lots of gooey brown gravy and it did have little shrimp but for a food based on seafood it didn't smell anything like it. I couldn't even keep the empty cans in the house! Pass on this one. We sent it right back.. Tried this with my 2 seniors, one is fussy, the other will eat anything. Neither would eat it past the first nibble. Tried mixing it with another food they like but they turned up their noses at that, too. Tried giving it to a local stray cat that is grateful for anything, and even she left it untouched! two fussy cats sniffed this and turned away. one generally omnivorous cat ate it without enthusiasm.